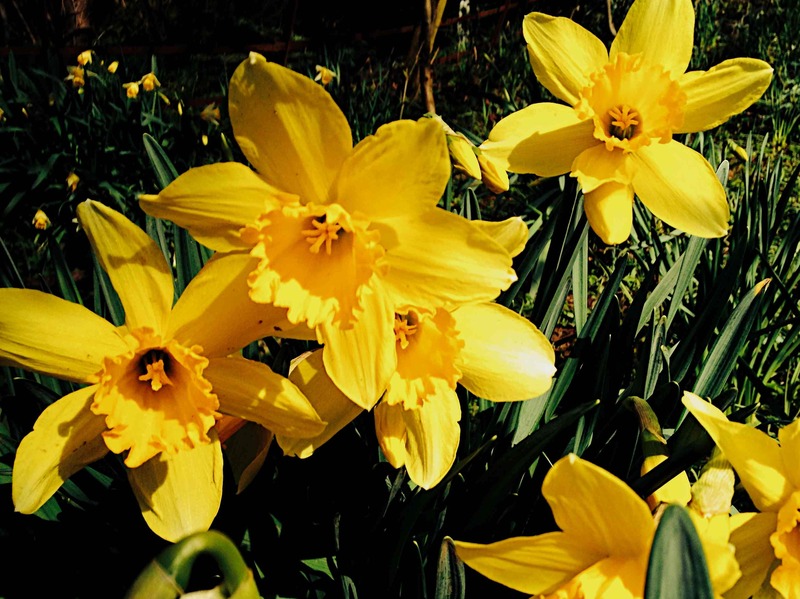 The daffodils are in full bloom and they’re everywhere. Gracie and I collect armfuls for the house and give a big bunch to Neil who’s up here checking the bees. Categories: country house, gardens, scotland | Tags: bloom, cycle, daffodil, flowers, season, yellow | Permalink. We are re re-jigging our plans. The old wing – which we intend to turn into a holiday let – was next on our list to do up, but we’re now planning to put any spare cash into the main house kitchen instead. We’ve realised how important it is to feel enthusiastic about each bit of the refurb’ and getting the kitchen done is an exciting prospect as it’s going to make a huge difference to living here. It’s a big job but as Ed’s no time waster I came home this evening to a surprise…. We think there could be an old bread oven on the left as there’s a different section of bricks there. It’s very deep to the back wall – a good few feet, which means we’ll likely be able to build in an inglenook seat as well as putting in a burner. 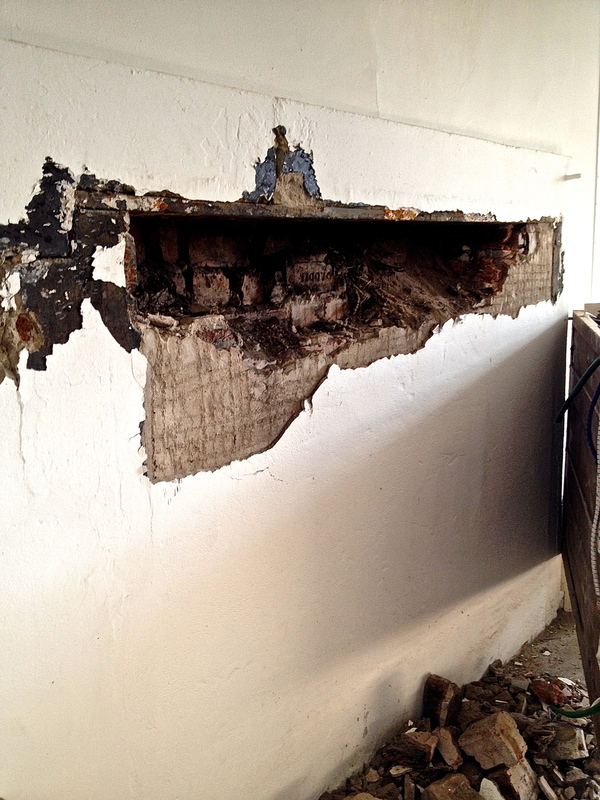 The stone lintel is sitting on what looks like an iron shelf – we’re not sure why… it could be holding up that whole wall! So we’re off. We still need to work out what to do with the flagstone floor (see My first mistake – Apr 25) – and this is further complicated by the fact that we’d like underfloor heating if we can; the flags are sitting on earth which will need excavating and they’re also very thick. We’ve a plumber and an electrician lined up from the work we’ve done before – but now the search is on for that holy grail of renovation; we need to find a good builder. Categories: castle, country house, refurb, renovation, scotland | Tags: bread oven, bricks, builder, fire place, flags, flagstones, floor, inglenook, kitchen, sledgehammer, underfloor heating | Permalink. We have bees. Well almost – they’re not quite ours yet. They belong to the local beekeeper Neil, who came to help with the bees in the walls of the house last summer (see The Bee Man – Jun 16). He’s put two of his hives in the paddock and when one of these is about to swarm it will provide a new colony for one of our own. Ed and Mr C got to know Neil through the local monthly Bee Association meetings which they’ve both been diligently attending since the autumn last year. After reading several books and asking lots of questions they are now raring to go. I’m a bit apprehensive about the whole bee thing so I’m putting off getting involved until Ed’s become an expert. 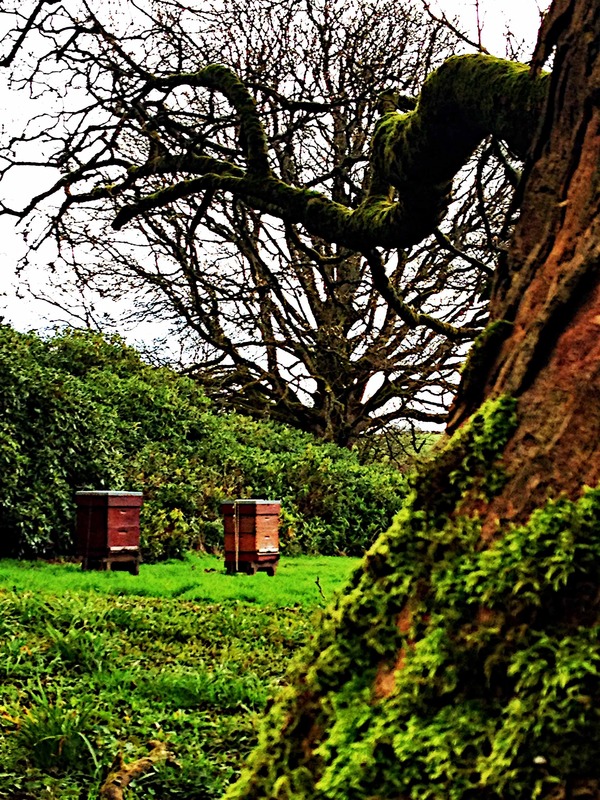 Neil put some foliage in front of each hive (you can’t quite see in the pic) to alert the bees to being in a new place as soon as they fly out. This means they’ll then create a new map of this area instead of relying on all their knowledge about their old location. Bees are of course super-sophisticated and all my primary school education keeps flooding back – like the “dances” they perform to tell each other where the pollen is. Ed says a key “dance” is like a figure of 8 – I’m trying to get him to demonstrate but he isn’t willing…. Currently the bees are pretty sleepy as we’re just coming to the end of winter – but towards the end of the spring they’ll be much more active. So when Ed gets back from his trip it will be swarm-catching time. Apparently there’s a plan to catch another swarm from the bees that live in the walls of the house. This is a more complicated arrangement and involves hanging some kind of scented ‘bee-catcher’ in the yew tree close by but I’m not totally clear on how that plan works! Categories: Uncategorized | Tags: bee, bee-keeper, colony, country house, gardens, hive, honey, paddock, pollen, swarm | Permalink.